Paper flowers are one of the most popular paper craft embellishments. There are so many types of flowers and so many techniques used to make them! From punched paper flowers to kirigami techniques to paper quilling patterns, the variety is truly endless. Learn how to make new and unique paper flowers with Origami Bonsai. This origami kit from Tuttle Publishing contains several tools to teach you how to make unbelievable floral designs and sculptures. Author Benjamin John Coleman has created a full-color 64-page instruction book and an instructional DVD totaling over three hours of content. This kit also includes folding paper for over 400 flowers and leaves. 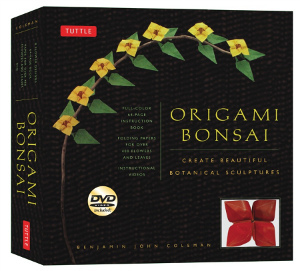 Origami Bonsai, according to Tuttle, is "the art of folding delicate paper flowers and leaves and attaching them to natural branches to create exquisite botanical art." These sculptures make beautiful, natural decorations for your home. The folding techniques used to create the gorgeous flowers are simple and detailed. This kit will teach you how to layer smaller flowers to create complex blossoms and add leaves to create further dimension. The origami bonsai technique is beautiful because it combines the natural elements of the branches with everlasting flowers made of paper. The unique floral designs you will create can become decor for your home or even inspiration in your paper craft room. Make miniature versions for card making or scrapbooking, and give your cards and layouts that natural element with real twigs. You will be amazed at the techniques you will master with this informative kit.